It was on 2 September 1945, 70 years ago today, that Japan formally surrendered on board the USS Missouri in Tokyo Bay, bringing an end to the most devastating of armed conflicts the world had seen. It was a war that “impregnable fortress” that was Singapore found itself drawn into, having been bombed and subsequently occupied by Japan over a three and a half year period that counts as the darkest in modern Singapore’s history. The surrender ceremony in the Municipal Chamber, 12 September 1945, source: Imperial War Museums © IWM (A 30495). The formal end of the war and occupation came to Singapore a little after the surrender in Tokyo Bay, an end that was commemorated in a simple yet meaningful ceremony held in City Hall Chamber (now within the National Gallery Singapore) last Thursday, 27 August. Held in the very hall in which the war in Southeast Asia was formally brought to an end on 12 September 1945, the two hundred or so guests were reminded not only of the surrender, but also of the otherwise unimaginable pain and suffering of those uncertain days. Speaking during the ceremony MAJ (Retired) Ishwar Lall Singh, of the SAF Veterens League, revisited the trauma of war; his experienced echoed by the distinguished poet Professor Edwin Thumboo through a recital of verses recalling the days of Syonan-to. City Hall Chamber, during the commemoration of the 70th Anniversary of the end of the war. The short ceremony was brought to a close by the sounds of a lone bugler filling the hall with the poignant strains of the Last Call and and then the Rouse on either side of the customary minute-of-silence, just as the call of the bugle on the Padang might have been sounded at the close of the events of 12 September, 70 years ago. Then, the surrender of forces under the command of Field Marshal Count Hisaichi Terauchi, whose grave can be found at the Japanese Cemetery in Singapore, had just been sealed in the Municipal Chamber, an event that was witnessed by scores of jubilant residents freed from the yoke of war. The Last Post, 27 August 2015. The Instrument of Surrender signed on 12 September 1945, source: Imperial War Museums © IWM (IND 4818). General Itagaki and the Japanese contingent being escorted up the steps of the Municipal Building fro the surrender ceremony, source: Imperial War Museums © IWM (CF 719). The steps of City Hall today, now a wing of the soon-to-be-opened National Art Gallery Singapore. The war had in all reality come to an abrupt end four weeks prior to the former surrender in Singapore, through the announcement by Emperor Hirohito broadcast to the people of Japan at noon on 15 August of Japan’s acceptance of the terms of the Potsdam Declaration. That had called for the unconditional surrender of all Japanese forces, a surrender that was to be formalised on the USS Missouri. 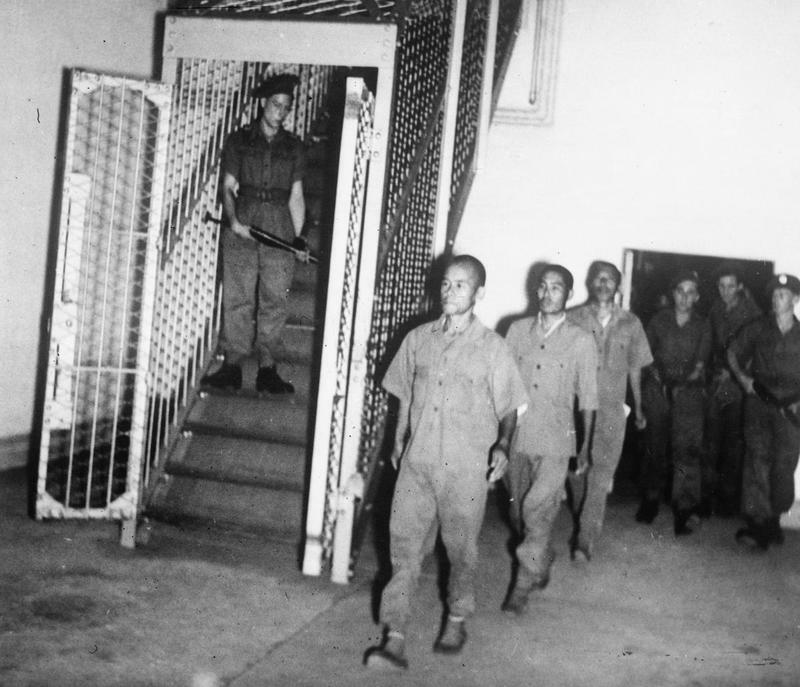 The impact of the announcement was however only to reach the shores of Singapore on the morning of 5 September, some three weeks later, when troops from the British-led 5th Indian Division made landfall to begin the reoccupation of Singapore. Reoccupation troops from the 5th Indian Army on landing craft headed into Singapore, source: Imperial War Museums © IWM (SE 4636). It may be thought of as fortunate that the end of three and a half years of darkness came with little of the violence that had accompanied its beginning. It could have been very different. The 5th Indian Division were poised to launch an invasion of Singapore (and Malaya), which would have taken place on 9 September 1945, if not for the surrender. MAJ (Retired) Ishwar Lall Singh greeting Minister Lawrence Wong, the Guest of Honour at the commemorative event. Even with the surrender, there were many in the ranks of the occupying forces who were prepared to carry the fight on to the death. One was General Seishiro Itagaki, the most senior officer after Field Marshal Terauchi. It was Itagaki who would later sign the Instrument of Surrender on the bedridden Terauchi’s behalf, having accepted the Supreme Commander’s orders with some reluctance. This however did not stop some violent deaths from taking place. Some 300 Japanese officers chose death over surrender and took their own lives after a sake party at Raffles Hotel on 22 August. A platoon of troops had reportedly chosen the same end, blowing themselves up with hand grenades. General Itagaki onboard the HMS Sussex signing the terms of Reoccupation on 4 September 1945, source : Imperial War Museums © IWM (A 30481). By and large, the first British-led troops to land late in the morning on 5 September, encountered none of the resistance some had feared. The terms of the reoccupation were in fact already laid out during an agreement on initial surrender terms that was signed on board the HMS Sussex the previous day. The first flight, which included a contingent of pressmen armed with typewriters alongside fully armed troops, made the two-hour journey on the landing craft from the troop ship HM Trooper Dilwara, anchored twenty miles away out of gun range, bound for Empire Dock “a few minutes after nine o’clock”. An account of this and what they encountered is described in a 5 September 1946 Singapore Free Press article written for the first anniversary of the reoccupation. The same account tells us how the flight had come ashore to “docks that were almost deserted, except for one or two small crowds of Asiatics, who cheered from the water’s edge”. A view down Bras Basah Road during the reoccupation on 5 September 1945, source: Imperial War Museums © IWM (IND 4817). Among the 200 guests at the commemorative event were survivors of the war, who were accompanied by family members. The streets of Singapore had apparently been well policed in the interim by the Japanese. In maintaining sentry at major intersections, the Japanese troops also kept the streets clear to receive the anticipated reoccupation forces and it seems that it was only after word spread of the returning British-led forces that the large cheering crowds seen in many photographs circulated of the reoccupation, began to spill onto the streets. Crowds lining the streets of Singapore to greet the reoccupying forces, source: Imperial War Museums © IWM (SE 4659). For most part, the horrors of war, and the liberation that came, are now quite forgotten. While the dates were remembered as Liberation Day and Victory Day in the first years of the return to British rule, 5 September and 12 September have all but faded into insignificance in a nation now obsessed with celebrating it most recent successes. While the initial years that followed may not immediately have fulfilled the promise that liberation seemed to suggest, we are here today only because of what did happen, and because of the men and women who lost their lives giving us our liberation. Japanese troops being put to work rolling the lawn of the Padang during the reoccupation, source: Imperial War Museums © IWM (SE 4839). The same roller spotted at the Padang sometime last year. Joy and hope on the streets. Children following a trishaw carrying two sightseeing British sailors from the reoccupying forces down High Street. Source: Imperial War Museums © IWM (A 30587). City Hall and the Padang, where the Surrender and Victory Parade took place against the backdrop of a thriving and successful Singapore 70 years on.